Say hello to spring! Seriously. Do it right now. Wave at it and maybe, just maybe it will poke its head up, push these crazy polar blasts far, far away and bring on the warm waves of spring. While we are all in denial about the weather, let’s update our Spring wardrobe shall we? I spent last weekend organizing my closet and let me tell you, every time I walk in there I smile. I can see every piece of clothing I own. It’s magical. (And my husband vacuumed it for me,which makes him magical.) I now know the Spring items I own and the Spring items I have to have – I mean want. 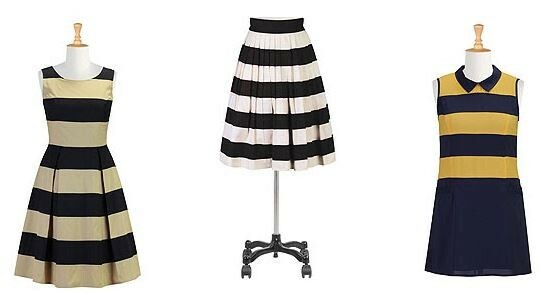 One of those is a striped skirt. Very specific no? I already own a striped maxi dress from ETSI that I adore and can’t wait to wear again this Spring/Summer, but now I need a skirt. I have just the one in mind. Are you ready to chat about stripes? 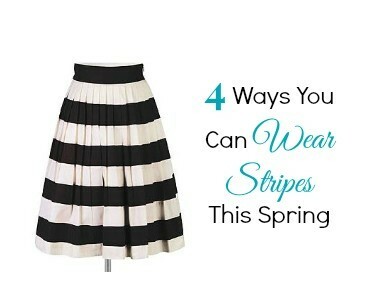 How about four ways to wear them? Perfect. Let’s get started. These tips are courtesy of the fabulous fashion experts from eShakti! This is one of my favorite ways to wear stripes – colorblocking. 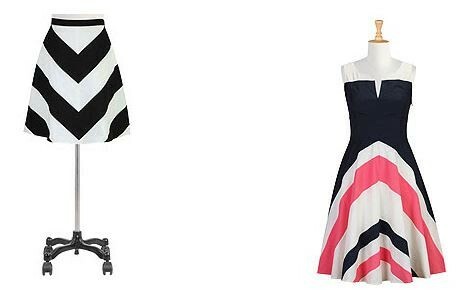 Thick stripes like these never go out of style and buying an investment piece like this cute skirt or one of these dresses, is a great way to go. Speaking of this skirt, this is the must-have item I want to add to my wardrobe! Love it. Pair any of these with an edgy blazer for a modern look. What’s black and white and striped from head to toe? Yep, a zebra. Maybe you shouldn’t go for the head to toe striped look and instead opt for some striped detailing in the piping or the trim. It’s a subtle way to wear the trend. Wear a contrasting pair of shoes to complete the look! 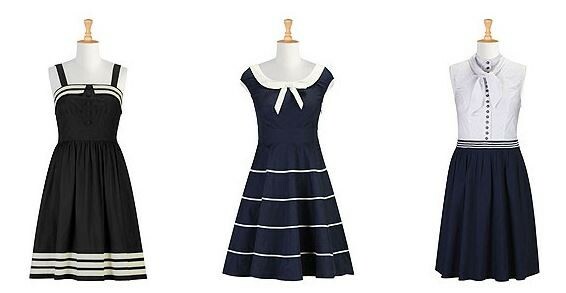 These dresses are screaming my name. You heard it too didn’t you? Oh. my. goodness. Are you tired of the Chevron stripes trend yet? I had someone ask that on Facebook the other day and it took me 0 seconds to think about. My answer was NO. I loved it 6 months ago, I still love it and I will love it if you ask me again in another 6 months. Here’s why I’m not sick of it. I accent with the pattern a little bit. I didn’t go over board, which is what you can do in your wardrobe. 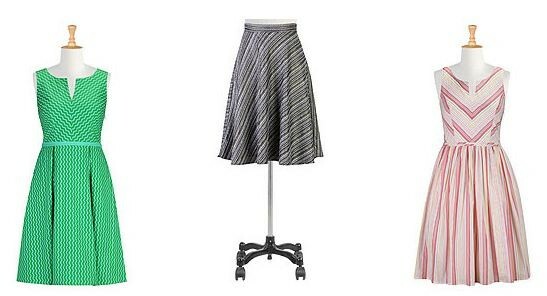 Buy one or two pieces in the pattern, not every single skirt in that pattern in every single color they have. Right? Here’s another reason why you want to add a chevron skirt to your wardrobe. Chevron stripes are incredibly flattering because they elongate the area where they converge. A chevron-striped skirt will give you legs for miles and chevron stripes converging in the tummy area will provide an hour-glass illusion! You had me add “incredibly flattering” and “legs for miles”. Have you thought about or tried rocking a bold striped print? It’s fun, spring-y and flirty! Just look at these gorgeous dresses and skirt. Tell me these don’t ooze Fun with a capital F. 🙂 For a well-balanced look, pair with a solid, subtle pair of shoes that matches the lightest of the colors in the print. Are you ready to wear some stripes this spring? I know I am! Which look(s) do you already have or which one are you going to try first? Let me know! Previous articleFashion Friday: Cents of Style Hats $9.97 Shipped!